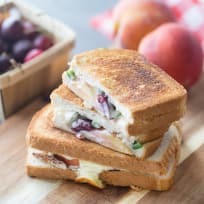 Chicken grilled cheese gets loaded with creamy Brie cheese, fresh cherries, peaches and poblano peppers. Totally irresistible, for sure! Grilled cheese may be the perfect sandwich. But there are actually a dozen ways to make it even more perfect! 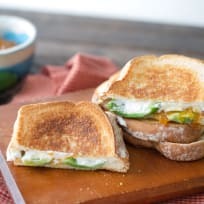 Jalapeño popper grilled cheese brings together creamy, spicy, and sweet in one bite! It’s sure to be your new favorite sandwich. 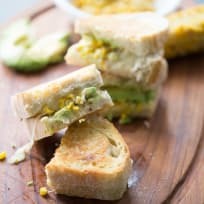 This avocado grilled cheese with roasted corn will be your new favorite lunch. Gosh, is it good. 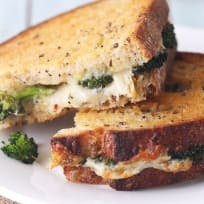 This lasagna grilled cheese takes all your favorite Italian flavors and makes them into an easy sandwich. Now you can have layers of lasagna goodness in no time at all! This Muffuletta grilled cheese offers all the earthy, gorgeous flavors of a homemade olive salad in one cheesy package. It's a lunch worth repeating. Caprese grilled cheese for two. Full of delicious Italian flavors and super easy too. A grilled caprese sandwich makes dinner easy peasy. Back to school, back to delicious! This lemon mascarpone grilled cheese starts with pound cake and is filled with creamy mascarpone and tart lemon curd. Not all sandwiches have to be savory! How about sandwiches for dessert instead? Fajita grilled cheese? You bet! Fresh peppers, onions, mushrooms and avocados combine with spicy Jack cheese for a kicked up Tex-Mex grilled cheese sandwich.